I grew up in rural southeastern Arkansas. When I say rural, I mean 10 miles on a gravel road from the nearest town which had a population a little below 3,000. We did not have electricity nor indoor plumbing until I was in the first grade. Getting a telephone line out to the house took a lot longer and that did not happen until after I graduated from college. We did have a television and got one station or two if the weather was just right. On Saturday night someone would climb the ladder to the roof of the house and twist the TV aerial so we could see Lawrence Welk. Without fail, everyday my mother made a pan of cornbread for supper (We always referred to the evening meal as “supper”). During the summer, it did not matter that the kitchen was unbearably hot, the oven would still be turned on to cook the cornbread. Leftover cornbread was crumbled in a glass of buttermilk and eaten with a spoon. During the summer, the leftover cornbread was cut in chunks, mixed with fresh tomatoes, chopped onion and green pepper, some crumbled bacon if there was some left from breakfast and mixed with Miracle Whip (we grew up on Miracle Whip rather than mayonnaise) to make Cornbread Salad. The first thing my mother taught me to cook was cornbread. The recipe that I copied when in elementary school began with, “Light the oven.” We had a gas oven that did not have an automatic pilot light and had to be lit with a match in order to turn it on. 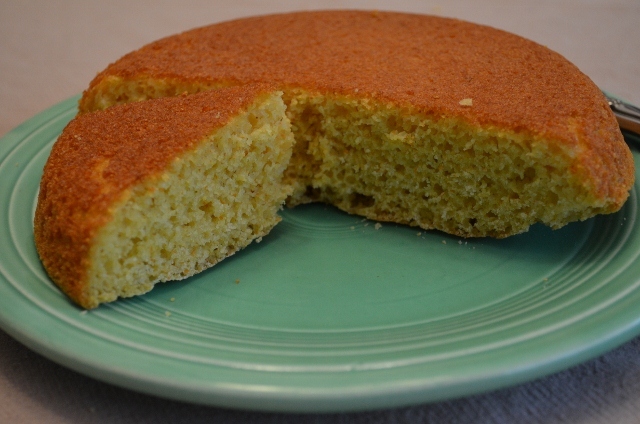 One question that comes up with cornbread lovers is sugar or no sugar? With my family it is definitely no sugar in cornbread. Putting sugar in cornbread would be sacrilegious. Also, cornbread is not cut in squares. It is cut in wedges… unless you are my husband who grew up in New York state and used to horrify my mother by cutting off slices on the edge in order to get a lot of crust. A comment on my mother’s recipe… She always had buttermilk in the refrigerator and self-rising flour in the cabinet. If you do not always have those two items on hand, you may want to substitute the buttermilk by using regular milk and stirring in a tablespoon of vinegar. Self-rising flour can be substituted by adding 3/4 teaspoon baking powder to all purpose flour. 1. Preheat oven to 400 degrees. Measure and sift the dry ingredients together. Add the egg and buttermilk and mix well. 2. Grease an iron skillet (8 inch) or some other appropriate cornbread pan and heat skillet/pan. 3. Pour the cornbread batter into the hot pan. Bake in 400 oven approximately 20 minutes. 4. Turn bread out on plate and enjoy with slathers of butter, some type of meat with gravy and lots of fresh garden vegetables. 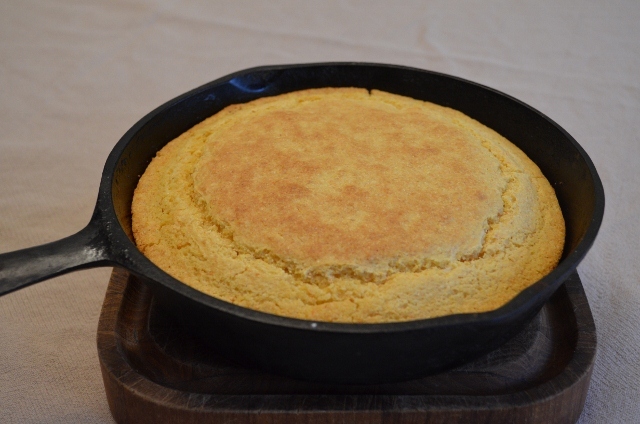 Glad you want to try the south Arkansas cornbread… Hope you enjoy it.